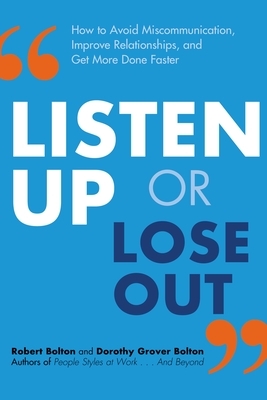 Most people retain only a fraction of what they hear, resulting in miscommunications and lost opportunities. But learning how to actively listen and absorb what a person is saying, thinking, and feeling can set the stage for dramatically improved relationships and increased personal success.In Listen Up or Lose Out, communications expert Robert Bolton highlights the underestimated and not well utilized tool of active listening and explains how it can be used to gather perspectives, bridge differences, and resolve problems. By breaking down listening into a set of learnable skills such as avoiding the urge to criticize, question, or advise; focusing on the speaker's point of view; asking the right questions, in the right order; and learning how to read people's feelings and reflect them back, Bolton explains how one can become a skilled listener who experiences fewer conflicts, makes better decisions, and discovers opportunities that others might miss. Whether personally or in business, could you benefit from better communication? Give listening a try. ROBERT BOLTON, PH.D., and DOROTHY GROVER BOLTON, ED.M., are cofounders of Ridge Associates, a training and consulting firm that serves many Fortune 500 companies. Together, they are the authors of People Styles at Work...and Beyond.